Wrought Iron Custom Furniture in Brisbane Homes and Businesses—the Finishing Touch You Need! The renovation is done, the paint is dry and you’ve moved the furniture back in. But something’s missing, you need something a little … extra. 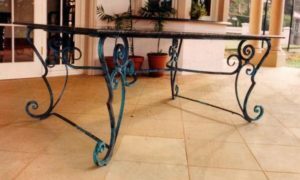 For the perfect finishing touch, consider commissioning a stunning piece of wrought iron custom furniture for your Brisbane home or business. Create a piece that’s all your own by combining timeless wrought iron, stunning modern designs and that extra dash of … you! Whether you’re aiming to recreate vintage charm or shake things up a bit with a trendy, faux-industrial look, your wrought iron furniture can be custom-built right here in Brisbane. From sturdy chairs to delicate side tables and detailed hinges, wrought iron is very popular for putting the finishing touches on your décor with your very own signature style. Its flexibility and durability as a material combined with skilled craftsmanship means that your commissioned creation can become a timeless part of Brisbane history. Brisbane has a recent tradition of converting commercial spaces into living spaces. Converting buildings such as the wool sheds in Teneriffe into apartments, and warehouses into trendy loft spaces, provides the perfect opportunity to leverage the modern faux-industrial look. Of course, you don’t actually want to live in a factory. Faux-industrial is not about filling your living space with greasy, smoky machinery. It’s about taking the best of the functional minimalist look and combining it with understated style to create a fabulous finish. High ceilings can mean vast spaces of stark white wall to fill. Transform these into minimalist works of art with a stunning wrought iron faux-industrial piece, custom-designed to fit the space. Shelves with detailed brackets can be moulded to create gorgeous but useful space to accommodate your books, ornaments, timepiece or lighting. Consider a one-of-a-kind wrought iron wall clock to help you keep track of time. Wrought iron chairs don’t have to look just like your grandmother’s outdoor setting with the traditional curlicues and swirls of ye olde times. Update the look to suit your modern space with clean lines and funky edges. Go for a simple design for your table and pair it with comfortably cushioned chairs with a sturdy wrought iron base. You might even decide to ditch the formal dining table altogether and opt for retro bar stools at your kitchen counter. It only takes a few touches to jazz it up with our custom furniture made in Brisbane. With a stunningly designed one-of-a-kind desk, coffee table or meeting table, your office will be transformed from boring to chic. Picture warm timbers with an elegant wrought iron base, finished off with a transparent glass top through which you can enjoy the sight of your furniture art. At Dean-Wilson Iron our blacksmiths combine time-honoured craftsmanship with stylish, modern design to create stunning custom furniture Brisbane residents are proud to display in their homes. With a truly bespoke piece to finish off your décor, you can feel connected with the rich heritage that comes with the creation of wrought iron while enjoying the modern lines of fresh designs. Use updated designs for your wrought iron furniture as a nod to the history of your area. Wrought iron has been used for hundreds of years for all sorts of items around homes and businesses. Naturally the technology has changed a little over the years, but the quality that saw wrought iron creations last for centuries has never faded. Maybe you live in a converted warehouse, or an apartment in the fully renovated wool store area of Teneriffe, and want to create furniture to echo the clacking of the machines or the clipping of the shears (minus the smell, of course!). Maybe you live in an older-style Queenslander and want to bring back some of the elaborate luxury of the federation era. Either way, building your signature piece from wrought iron will capture the historical significance, encapsulate timeless quality and enable you to put your own personal stamp on it at the same time. It’s great to be trendy and styles come and go, but why settle for having something that’s the same as everyone else? With custom-built furniture to suit your living space you can rest assured that you’ll have a one-of-a-kind piece to enjoy. Visitors won’t come into your home and say, ‘Oh, yes, that’s nice, I saw the same thing at Joan’s house yesterday’. They’ll be wanting to know where on earth you got your stunning coffee table or shelves or designer lighting done. You’ll be able to tell them they can look high and low but they won’t find it in stores—this piece was designed especially for you, and only for you. Since 1992 Dean-Wilson Iron blacksmiths have been creating exquisite hand-forged custom furniture Brisbane residents adore. We use traditional wrought iron production techniques to bring to life modern designs. The furniture we build puts old-fashioned quality back into modern chic. We’re not the only ones who think our designs are amazing. Our work has earned us a national trade award for blacksmithing, an HIA commendation and a Chamber of Commerce Small Business award. Call us today on 07 3814 0076 or contact us online to speak with our iron working experts about custom furniture for your Brisbane home or office. We can help give shape to your own design ideas or start from scratch to create the perfect wrought iron piece to finish off your décor. • Wrought iron vs steel fencing – which is better? Previous Post Everything You Need To Know About Modern Wrought Iron Production TechniquesNext Post Wrought Iron Patio Sets – Without the Twee!